2013/08/20We'll enter the stage again! You might not believe it, but after all these years we'll play a concert again. Come see us on Halloween, 31.10.2013 at the Movie, Bielefeld. 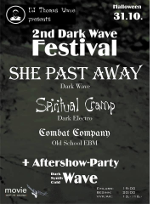 We'll be joined by Combat Company and She Past Away. We've decided to make our songs available on last.fm as full length previews. Enjoy! We just uploaded the song 'Exceptional' in full length to our MySpace site. Please visit http://www.myspace.com/spcramp. Careful observation of this webpage might have told you that pretty much nothing happened here. Well, we were all busy on other accounts. One of us, for example, moved to Scotland. Nonetheless, we're working on new songs, and we'll report back on that soon. We promise! We took part in a remix contest that is organized by the Mushroom magazine. In particular, we created some music for Anne Clark's spoken-words performance 'Closed Circuit'. If you'd like to vote for us, you can do so at this web page. Be careful however, our mix is not labeled as 'Spiritual Cramp', but as 'holgerschmiedl'. We gave interviews for the current issues of the German magazines Refraktor and Gothic. Furthermore, the magazines' CD add-ons contain one song of us, each. On another note, we finally uploaded the remix of "Raven", done by Massiv in Mensch, which you can find here. Lately, we remixed the song "Winterblut" of the Industrial band Xotox. The result will be released on April 24th on the CD "Dokumentation I: Ton". There's a new navigation item Media, which leads you to all kinds of freely downloadable stuff: You will find the usual mp3-snippets of rather new songs, some live videos and last but not least our first two demo albums. The remix of "Outside" we recently announced is also online now. We're pleased to announce two new remixes: The band Massiv in Mensch has remixed our song "Raven", while Law of the Dawn turned their attention to "Outside". You'll be able to download both mixes (full length) in due time. At the beginning of this year, both our label sad records and our booking agency Twilight Media quit their business. Luckily, A&F-Music Management now replaces the latter, but sadly we haven't found a new label yet. We're pleased to announce 2 concerts taking place this autumn. The first is on September, 24th in Gütersloh (Weberei), the second on October, 8th in Paderborn (Kulturwerkstatt). We just started a co-operation with another booking agency : Twilight Media. A few days ago, the compilation Modern Entertainment Vol. 6 was released. We are represented with the song Luk from our recent album. On Saturday, the 19th of February 2005, we are going to play in the Pleasure Dome (Oppenwehe). We have just revised our homepage, in particular the navigation. Hopefully the content is now organised more clearly and can be found easier and quicker.